Engineering the Panama Canal research papers examine the difficulty in building one of the greatest engineering challenges - The Panama Canal. Research papers on engineering the Panama Canal focus on the incredible technological feet that society had to embrace in order to put the canal in Panama. Nations had to come together to build the canal and your research paper must reflect what an incredibly complex task the engineering was. The first and greatest engineering challenge was cutting a pass through the Continental Divide which made it necessary to dig through the mountain ridge at Culebra. This area was chosen because it was the narrowest and lowest point in the mountainous Isthmus that joins the North and South American continents. Lieutenant Colonel Thomas Goethals, an experienced Army engineer acted as Chief Engineer during the project. Over 100,000,000 cubic yards of soil and rock had to be removed. Mudslides, accidents and equipment loss threatened to hinder the process, but Goethals was determined to see it completed. When it was completed, the Culebra Cut, later renamed the Gaillard cut, was a minimum of 300 feet wide along its entire 7.8 miles length, but was widened in the 1930's to improve navigation and allow two-way traffic for ships. 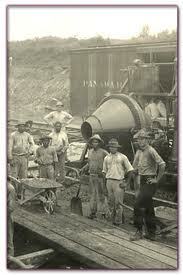 Another challenge was building a huge dam at Gatún to trap the Río Chagres and form an artificial lake. Gatun Dam, on the Atlantic was, at the time of its construction, the largest earthen dam in the world and Gatun Lake the largest manmade body of water in the world. Two other dams were built on the Pacific side - the Miraflores Spillway and The Madden Dam. With the building of the Gatun Dam, the Chagres River valley between Gamboa and Gatun became Gatun Lake, with the Chagres flowing into it at Gamboa. The building of the Gaillard Cut then extended the lake across the Continental Divide to Pedro Miguel Locks. The final challenge was building three double sets of locks. The Gatun Locks, Pedro Miguel Locks, and Miraflores Locks were created to raise the ships to the lake, almost twenty-six meters above sea level, and then lower them. The original lock canal plan called for a three-step set of locks at Gatun, one step at Pedro Miguel and a two-step at Sosa Hill. At the Gatun Locks on the Atlantic side, workers poured enough concrete to build a wall 8' wide, 12' high, and 133 miles long. They built culverts the size of railroad tunnels to channel water from Gatun Lake into the locks. Pittsburgh's furnaces roared as more than fifty mills, foundries, and machine shops churned out the rivets, bolts, nut, girders, and other steel pieces the canal builders needed. In late 1907, it was decided to move the Sosa Hill locks further inland to Miraflores, mostly because the new site provided a more stable construction foundation, but also because it afforded greater protection against sea bombardment. The Path Between the Seas research papers examine the book by David McCullough that goes into the creation of the Panama Canal. David McCullough Research Writing discuss the focus of the book, which is mainly on George Washington and his leadership. France and the Panama Canal research paper outline the history of the French and their attempts to build the Panama Canal. Paper Masters writes custom research papers on Engineering the Panama Canal and examine the difficulty in building one of the greatest engineering challenges - The Panama Canal.